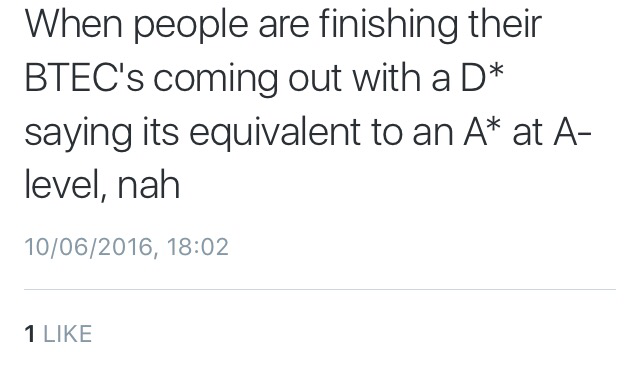 Why taking a BTEC doesn’t mean I’m stupid. – She Wears Stripes. A rant of a post does seem maybe slightly full on for only my second post, but I thought I’d begin with a subject I know very well, and one I will feed into further planned posts. I also think this post will really help you lovely people reading this so early on in my blogging a sense of me. But due to it being one of my first posts, I’m going to keep it short and sweet in the hope that I don’t lose the point of this post and it gets very boring to read. This post idea initially began when I saw a derogatory tweet recently about BTEC students, so I decided to search the word to see what kind of tweets came up, which I’ve scattered throughout this post. I scrolled down for a good 15 minutes and only 2 of them were positive, the rest were either slagging off those who took this type of course or used the word as a replacement for stupid. For many of you in the UK, the word BTEC may be familiar to you, for those who aren’t aware of what it means let me explain. BTEC is a type of course you can take at A-Level and in some cases GCSE level where you practice vocational subjects such as Fashion, like myself, consisting of generally 100% coursework. 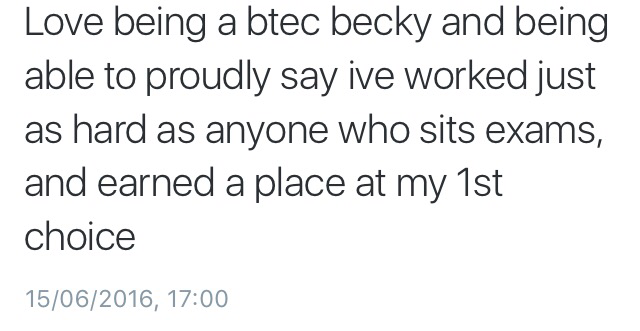 Basically, it’s just a course you can take that isn’t a traditional school subject that is geared to practical skills but for some reason for many the word BTEC actually means stupid. Obviously, I cannot talk for all courses and I am aware not everyone has these opinions towards my course, but this post has been put together from my experiences of being a BTEC student over the past 2 years. My most common feeling I felt from others in my year is that they felt my course was not at the same standard as there’s and in fact it was easier, especially now during exam season where some people I know have 9 exams whilst I had 1. What I feel is important to understand is although, in the summer we are done, we work bloody hard every single day of the year, sometimes working all holidays and weekends up until the early hours of the morning to keep up with the coursework. I even worked on my birthday and over Christmas, having to my history and English revision on the backburner because getting a high grade was more important to me. Although it only seemed this year that I only took 2 classes, in fact I had 3 fashion projects running alongside each other sometimes with deadlines on the same day. I think it’s actually hard to put into words how hard myself and my classmates have put into the last 2 years, I made a bloomn’ wedding dress! Furthermore, our pieces were marked throughout the course, so my final grade is much more reflective of my actual ability and intelligence, unlike my history grade that will be reflective of one exam which I struggled with due to my nerves and lack of photographic memory! I could also suggest that taking my course has prepared me much more for a career and studying at a higher level than any of my more academic subjects have ever done, I have learned time management, working independently, research skills, to work hard not just once a year but constantly to name but a few. I feel already that I am starting to waffle and go off the point so I will leave it on this point my mum once said to me, if BTEC students are so unintelligent and they are so intelligent, then why do they have to hire a plumber, or go to the hairdressers, or employ a gardener, or wear clothes from shops. If they are so much smarter, they should be able to do all this themselves yet they don’t. To make many essential parts of life work we need skilled men and women yet so many do not recognize that. The Fashion Archive- May the Odds be in Your Favour – She Wears Stripes. I agree with this completely! I get so depressed/angry when people see me as an inferior due to the fact that I didn’t do the traditional route.